Fort Greely is a United States Army launch site for anti-ballistic missiles located 5 miles south of Delta Junction on the Richardson Highway. It is also the home of the Cold Regions Test Center (CRTC), as Fort Greely is one of the coldest areas in Alaska, and can accommodate cold, extreme cold, or temperate weather tests depending on the season. It is named in honor of Major General Adolphus Greely. Fort Greely’s history dates back to 1942 when 1st Lt. William L. Brame led an advance detail of 15 men to the Big Delta area to establish an Army Air Force Base. Throughout World War II, the sole purpose of the base was as a transfer point for the Lend-Lease program to Russia. American aircraft were flown to the base from the ‘lower 48’ and turned over to the Russian pilots who in turn flew the aircraft to the Soviet Union. The base became an Army Post in 1948. It underwent several name changes until, in 1955, it was designated Fort Greely in honor of Maj. Gen. Adolphus Washington Greely. Greely was an Arctic explorer and founder of the Alaska Communications System. After World War II, the War Department decided that the American Soldier must be able to live and operate in any degree of cold. This decision was based on experience gained in combat and predictions of future possibilities for international obligations. A group of task forces was therefore organized to test U.S. Army equipment in the cold. Task Force Frigid and Task Force Williwaw were dispatched to Alaska during the winters of 1946 and ‘47. 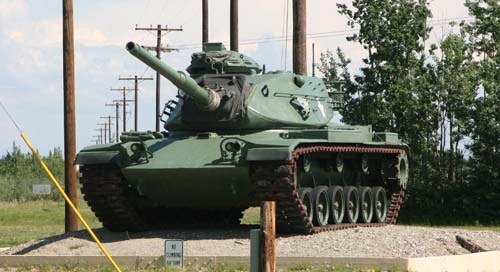 A related trial unit, Task Force Frost, incorporated elements of the 66th Armored Regiment and underwent tests in Camp McCoy, Wisconsin at roughly the same time. In 1949, the Department of the Army ordered the organization of the Arctic Test Branch at Big Delta Air Force Base, Alaska (now known as Fort Greely). A cadre for the organization was activated at Fort Knox, Kentucky, in March 1949, by the transfer of personnel from each of the “Army Field Force Boards.” The organization moved to Alaska in July 1949 and test operations were initiated. Shortly thereafter, the organization name was changed to the Arctic Training Center. In 1957, it was renamed the U.S. Army Arctic Test Board, with the mission of conducting Arctic service tests of all Army field equipment. From 1955, Fort Greely and a huge tract of land around it (withdrawn from the Department of the Interior) were used for training soldiers for cold weather combat during the Cold War with the former Soviet Union. In August 1962, as a result of the reorganization of the Army, the Arctic Test Board was established as a Class II activity and placed under the command of the U.S. Army Test and Evaluation Command (TECOM). The Board was later renamed the Arctic Test Center and expanded to absorb the Research and Development Office, Alaska, the Technical Services Test Activity, and the General Equipment Test Branch, all located at Fort Wainwright, Alaska, and the Chemical Corps Test Activity at Fort Greely. In 1976, the U.S. Army Arctic Test Center was re-designated the U.S. Army Cold Regions Test Center. The Cold Regions Test Center is well into its first half-century of service. Established in 1949 as the Army’s Cold Regions Test Branch, the Center exists as a site for testing equipment under the strain of severe Arctic conditions. Tests have included year-round feasibility and service evaluations on freeze-dried foods, cold weather clothing and Arctic oils and brake fluids. Equipment testing has also been conducted on the Cobra, Blackhawk and Huey helicopters, the Dragon Guided Missile System the Abrams M-1 Tank and a variety of other weapons. More recently, the center has tested an inflatable helicopter hanger for field use and the NASA Aerostat. Due to its isolation, remoteness and harsh winter weather, Ft. Greely was considered by Dept. of the Army as an “Overseas” tour of 1 year for unaccompanied soldiers and a 2 year tour for those with their dependents. Because of the unique working and living conditions and the missions of the soldiers assigned to Ft. Greely, it is no wonder the title “Home of the Rugged Professional” has been applied to the post. In the 1980s, when the Cold War ended with the collapse of the Soviet Union, Fort Greely was gradually realigned through a gradual draw-down in the numbers of soldiers. In 1995, Fort Greely was selected for realignment (but not closure) as a cost-saving measure. Only the Cold Regions Test Center (CRTC) and Public Works functions were to remain on the installation. Large portions of the post were to be closed and, at one point, the main post was to be turned over to the city of Delta Junction for use as a private prison. Ultimately, plans for the prison fell through. In 2001, headquarters for the Northern Warfare Training Center and Cold Regions Test Center were moved to nearby Fort Wainwright. Training ranges were also transferred to Fort Wainwright control and renamed Donnelly Training Area. 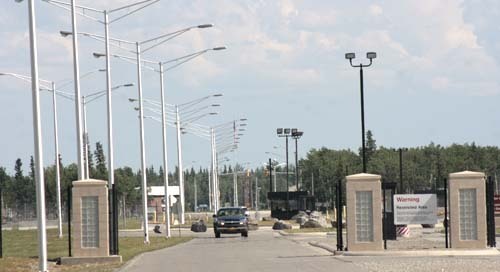 Although its command moved, CRTC continued operating from Fort Greely. The Northern Warfare Training Center also continued operations at Black Rapids Training Facility. Testing efforts are centered at the Bolio Lake Range Complex, approximately 10 miles south of Fort Greely. Arkansas Range is the main test site for mines and small arms. Washington Range is a multi-purpose range used for air defense missile firings, artillery tests, such as Sense and Destroy Armor (SADARM), and smoke and obscurant tests requiring large areas and mobility testing. Texas Range is available for direct-fire tests, as well as sensor, small arms, and missile tests. Oklahoma Range, primarily used for indirect-fire work, is capable of observed fire to 30 km and unobserved fire to 50 km. With the continued development of an intercontinental ballistic missile program by North Korea, Fort Greely may be slated for an expansion. An anti-ballistic missile facility may be required to protect Alaska and the West Coast of the United States from possible North Korean attacks.